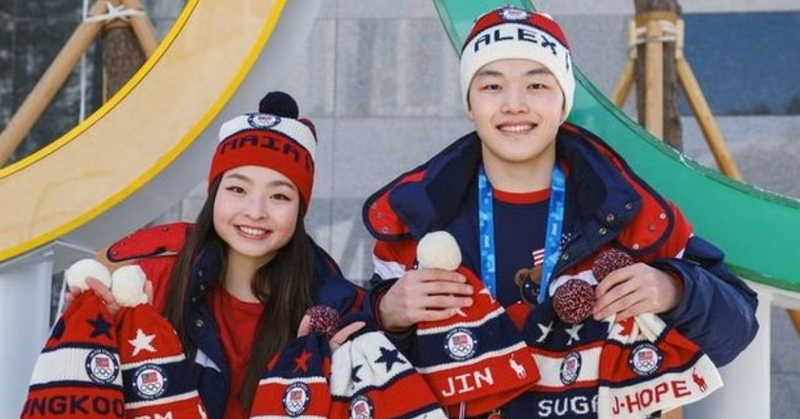 Alex and Maia Shibutani are American figure skating siblings who won bronze at the team skating event in the 2018 Winter Olympic Games in PyeongChang. Alex Shibutani tweeted out a photo of himself with his little sister Maia with a comment that read "Hey fam! @MaiaShibutani and I have these awesome hats for the guys and we want to make sure they receive them. How do we make this happen? @BTS_twt @bts_bighit #BTSArmy." In the photo, Alex and Maia are holding seven knit hats just like the ones they are wearing. The names of BTS members are embroidered on the hats. Who knew these American ice dancer siblings were ARMYs!